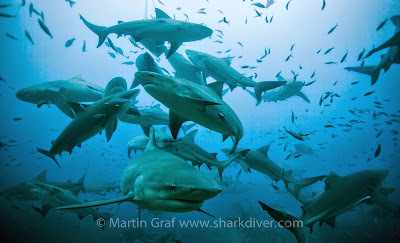 This is the 4th year Shark Diver is going to Fiji to dive with Bull Sharks at Beqa Shark Reef Marine Reserve. In the last 3 years, we have been diving with more than 70 Bull Sharks at a time, with Black Tip-, White Tip-, Grey Reef-, Nurse- and Lemon-Sharks also being seen on almost every dive. Occasionally we even got a visit from a Tiger Shark. While I love "my" Great White Sharks, I have to say that it is hard to beat the excitement of what Ron and Valery Taylor called "The best shark dive in the world". Our partner in Fiji is Beqa Adventure Divers "BAD". BAD is truly an exceptionally GOOD dive operation who was instrumental in creating the Shark Reef Marine Reserve, which is now officially a national marine park and fully protected. Celebration - BAD Cut from Beqa Adventure Divers on Vimeo. BAD is so good that the government of Fiji has designated them to be the official caretakers of the park, with their staff being the designated fish wardens, empowered to enforce the rules of the park. BAD is also a carbon neutral operation that supports the Mangroves for Fiji, a vital project that not only helps to offset carbon emissions, but also provides a crucial habitat for many marine creatures, including sharks. BAD describes itself as "a conservation project masquerading as a dive shop" and they really mean it. They are a prime example for how conservation and business can not only coexist, but actually be mutually beneficial. One of the ways they make sure that the project works is by not only paying a levy to the fishing villages in exchange for them to not fish at the reef, but also by hiring their staff from those villages to provide an alternative income to the villagers. All the dive staff at BAD is from those local fishing villages. To see how the project works, click here. Shark Diver is diving in Fiji from May 8 - 29. A 7 day stay (5 days of shark diving), is starting at $1800 p/p double occupancy. The price includes 7 nights accommodation in a 4 star hotel, with a breakfast buffet edaily, 5 days of 2 tank shark diving and rt. airport transportation from Nadi airport. We can customize your dates and length of stay and also add some dives in the soft coral capital of the world. Cost of airfare from LA to Fiji varies from $1000 to about $1300, depending on day of departure. We can also book your shark dive with "BAD" anytime of the year, with or without a hotel. Call us at 619.887.4275 or email staff@sharkdiver.com for more info, or to book.